So wimgapi.dll is (in my opinion anyway) buggy as hell. Mount and Unmount commands can fail and it is consequently unpredictable using this via WinBuilder / PEBakery to build a WinPE. Using synchronicity's excellent wimlib-imagex it is possible to mount EXTRACT the contents of a .wim and use DISM to apply/install an ADK Optional Component. This is a relatively slow process due to the need to extract the full contents of the .wim file before running DISM and then rebuilding the .wim. So how about just extracting a minimal fileset and running DISM - for example just extracting the minimum files required for DISM to run? And then injecting the updates back into the original .wim. So how about just extracting a minimal fileset and running DISM - for example just extracting the minimum files from the .wim required for DISM to run apply a package to these extracted files? And then injecting the updates back into the original .wim. Anyone have any experience with this? I've done a quick test with just registry files and DISM failed. The DISM log is not helpful (for me). The directory D:\MistyPE\Projects\Cache\Adk.workspace4\mount\Windows does not appear to be a valid Windows directory. I've made this edit to try and clear up some of the ambiguity in my original post. Sorry to all involved so far from post #1 to post #22 for my poor wording which has led to misundertandings. In my defence, I have been up late coding and getting by on an average of about 4-5 hours sleep per night for nealy two weeks. Not helped by an excess of alcohol over the New Year period! 1] use a full Windows Host OS with an ADK installed (initial tests on 64-bit Windows 8.1 Update Host OS with the ADK for Windows 8.1 installed). 2] use wimlib to extract the minimum files from winpe.wim (.wim is from the ADK already installed on the host OS) that will allow me to complete step 3 (see below). 3] use the full DISM (from the ADK) to apply an Optional Component (aka Package) to the files extracted in step 2]. 4] use wimlib to inject any added/modified files created in step 3] back into winpe.wim. If this is possible then by extracting just a few files instead of the full contents of winpe.wim there will be a significant increase in the speed of the extraction process. The injection process should also be significantly faster than building a new .wim. Due to the poor wording and ambiguity of my original post the goal was taken to be finding the minimal DISM dependencies required to run DISM to add an Optional Component/package to a (fully?) extracted winpe.wim file. Maybe facilitating the package installation process without the need to install the full ADK. Actually both topics may be connected : dism.exe is a black box and there may be some un necessary extra steps in there. A new custom dism.exe could help achieve both goals : less dependency on the host and less logic when mounting/updating a wil/vhd file. Would a "normal" trace with Dependency Walker help? Do the .dll's need to be registered? Which specific Windows version(s) are you experimenting with? Thinking loud, would it be worth it to come with a more minimalist version of dism implementing only the features you need, possibly with less dependencies ? I could give a try and provide a version implementing only addpackage or addriver or addfeature a try. Host Operating System is Windows 8.1 Update (6.3.9600). ADK is for also for Windows 8.1. Highly unlikely! When the full contents of boot.wim (unmodified - from ADK for Windows 8.1) are extracted, then DISM runs successfully. In my experment with minimal paths/files extracted from the same boot.wim, DISM fails. My theory is that something/file that DISM checks is missing in the test environment with minimal extracted files - just not sure what. P.s. I've attached DISM logs. One from a failed build and the other from the successful build when the full contents of boot.wim was extracted. I'm using the DISM included in the ADK (for Windows 8.1) download. Any input however would be greatly appreciated - with whichever DISM version you have to hand. I will try again with a full (but empty of files) directory structure to see if that makes a difference. My idea was to directly use DismAPI.dll as I suspect that dism.exe does a few checks, requires extra dependencies, etc. If my theory is right, then you would "only" have to fetch dismapi.dll from the right imaging solution (waik, adk, 8.0,8.1,10.0, etc ...) to be able to perform basic task such as adding a package. I will quickly put up a simple exe and see how it looks. Might be a red herring but it worth testing. 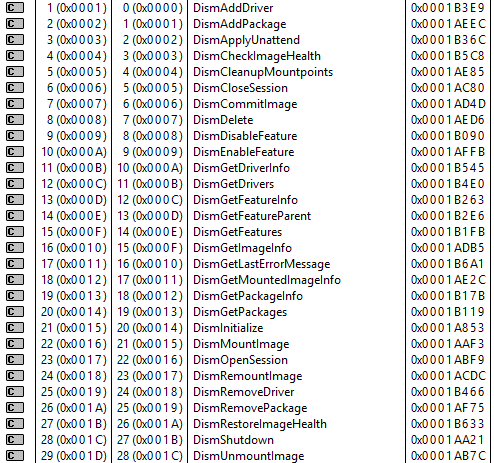 check PM : i have put a dirty dism GUI using dismapi.dll (found in my system where adk/waik is not installed). of course most probably some of the files are not needed, but you can try with the whole set above and delete what seems like unuseful until the *whatever* commands you need stop working. I used GetWaikTools, and downloaded "dism for win8.1" (ADK_5). In the x86 sub folder, I was able to call the following dismapi.dll function : initialize, opensession, adddriver, closesession but not the mount/unmount functions. Looks good so far then as Misty is not looking for mount/unmount (task performed by Wimlib). Edit : mount/unmount functions work as well (the destination folder shall not exist before calling mount). Misty, how do you know which files to extract from the boot.wim, are you saying you only want to extract a subset of the files and "apply" the new packages "onto" these files? Are you saying there's a list of "affected files" in these packages? Edited by Atari800XL, 04 January 2018 - 05:57 PM. Sure it works , the point is (was) if some (many) of those files are not needed for Misty's uses, i.e. the minimal needed fileset. I am in the process of asserting that you only need dismapi.dll and its dependencies. I am pretty sure all other files are not needed. At least this what my custom exe tells me loading dismapi.dll and calling a few functions. I don't - not yet anyway. I managed to get a bit further, but am still running into errors. Yes - only the smallest number of files possible in order to get DISM to work. DISM appears to check a number of files in the mounted (or extracted) .wim and if these are not present then DISM will fail to apply the package. The advantage of extracting a smaller set of files (if it works) will be less time extracting the files and then injecting them and the newly applied optional component files back into the base .wim via wimlib after the packages are applied. It's still not working, but it's getting closer. I'm not an expert on this, but doesn't this work like update files in Windows? Do the Optional Package files contain a list of files to be modified? Abbodi1406 seems to be one of the experts on Windows update files, maybe he also knows how these Optional Package files are constructed? ...of course most probably some of the files are not needed, but you can try with the whole set above and delete what seems like unuseful until the *whatever* commands you need stop working. You are kind of missing the point of my little experiment. My goal is about tracing which (minimal set of) files need extracting from my WinPE .wim file so that DISM on my Host OS can apply a package (Optional Component) to the extracted WinPE files. If I can get away with extracting lets say 100MB of files from my .wim file and apply a package to only those files then I can avoid extracting the full contents of my .wim - saving significant time. Hope this makes sense. Well, I am not 100% ok with that. 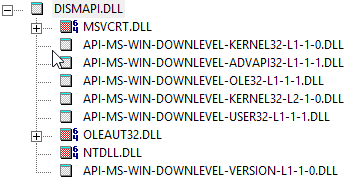 Using dism.exe from MS and calling the API (from dismapi.dll) directly may lead to different results : we dont know for sure what extra steps are undertaken in dism.exe. Also, calling the API directly may lead to more interesting developpement in the future where more tasks can be automated and/or mixed with other tools such as wimlib. Ideally it would be nice to deal with WIM files without any dependency to MS tools. Wimlib was a major outbreak already and many winpe tools these days are built on that. Unfortunately we still need dism to perform some extra steps such as adding drivers or packages. But I am deviating from Misty objective there. ...But I am deviating from Misty objective there. Please hijack away - this is getting interesting. And if I don't get any closer to my original goal then the community may get some extra tools out of it anyway. A little Christmas bonus. Some nice (and very fast) work from Erwan has led to several builds to test. I've successfully added WMI and NetFx packages to a WinPE image mounted in Erwan's new tool. Can't wait to see where this goes. My original post has been edited to try and clear up any confusion to anyone new to this discussion. Sorry Wonko in particular as you have educated me on numerous past occasions about the benefits of being more specific about my questions. And for the record I am not being sarcastic! Ok, after MIsty's and erwan.l's clarification, now I understand maybe . . Allow me to re-state the points at hand (please bear with me, I am trying to understand). Now, if I get this right there is part 2 where the attempt is to "service" a set of extracted files. And here I am losing both of you. If I get it right, the whole DISM "servicing" stuff is intended to service a WIndows installation, either "flat" or inside a .wim (or as erwan.l's mentioned a .vhd, that as I see it is only a container for a "flat"), so the new question is which minimal, "fake" Windows installation can be serviced by DISM? I am talking not of the files added by the DISM apply-package, but rather about the related Registry entries, registrations, etc. I mean, it is entirely possible that "package 1" *needs* files a, b, c BUT that "package 2" *needs* files a,b, c and d, then, it is possible that in the .wim file d is a hard link to another file, would DISM take care of that? As well, it is possible that some paths are kept, so that the "temporary target" needs to be a mounted RAW image or a .vhd as to recreate the same folder structure as the "real thing". In any case IMHO, the (nice BTW) "external" or "direct" approach by erwan.l, needs anyway to be validated against the results from using the original DISM, i.e. we need first to be able to do that with DISM, and then check if the (faster, better) interface to dismapi.dll works the same. What I suspect - in other words - is that only *some* packages (the simpler ones) can be applied and re-inserted properly in the .wim, whilst more complex ones will need either more files extracted or some trick/workaround. I am preoccupied about possible "false positives", i.e. packages that *seem* to have been serviced and reapplied correctly but that on execution (possibly of a specific. particular command/option) fail in the final build, and it is probably a nightmare to fully test the functionalities of the results. Of course as long as the specific packages that are *needed* to be serviced and re-applied are of the simple type the idea/method by erwan.l is very good . ...Ok, after MIsty's and erwan.l's clarification, now I understand maybe . . The full DISM fileset downloaded using JFX's getwaiktools are definitly not all required. Although I haven't traced all dependencies yet, with just the .dll files (and associated .mui files) Erwan's tinydism is working. ...If I get it right, the whole DISM "servicing" stuff is intended to service a WIndows installation, either "flat" or inside a .wim ....so the new question is which minimal, "fake" Windows installation can be serviced by DISM? With wimlib-imagex. If the registry files are part of the minimal fileset extracted from the WinPE .wim then any modification made to the registry by DISM will theoritically be present when the file is injected back into the .wim via wimlib. MistyPE uses this approach of extracting, modifying and injecting the registry files and it functions fine. If we are talking about using TinyDISM then it appears to add the packages to a full WinPE correctly. Tested using HTA, WMI and NetFx packages from Windows 8.1 ADK. The full DISM is reporting all packages on the fully extrated .wim files as installed. I tested the new .wim in a VM and it appears to function fine. Notice that I have used the word appears - you are correct that more validation needs to be done. And we are some distance from testing against a subset of extracted WinPE files rather than the fully extracted or mounted contents. P.s. I'm supposed to be at work!